When you distribute leads to buyers or sales teams you want to be absolutely certain that they will make the most of them by converting as many leads as possible into paying clients. Instant Leads Generator is a lead management system that gives you and your lead recipients all the tools needed to do this. With Instant Leads Generator you have all the tools at your disposal to distribute and track every lead you ever acquire. From the moment it is generated right up to the time that it closes, system administrators, lead buyers and sales personnel will know exactly whats happening with each and every lead. A comprehensive range of lead tracking tools will ensure that no lead is ever forgotten and that all opportunities are followed up effectively to completion. 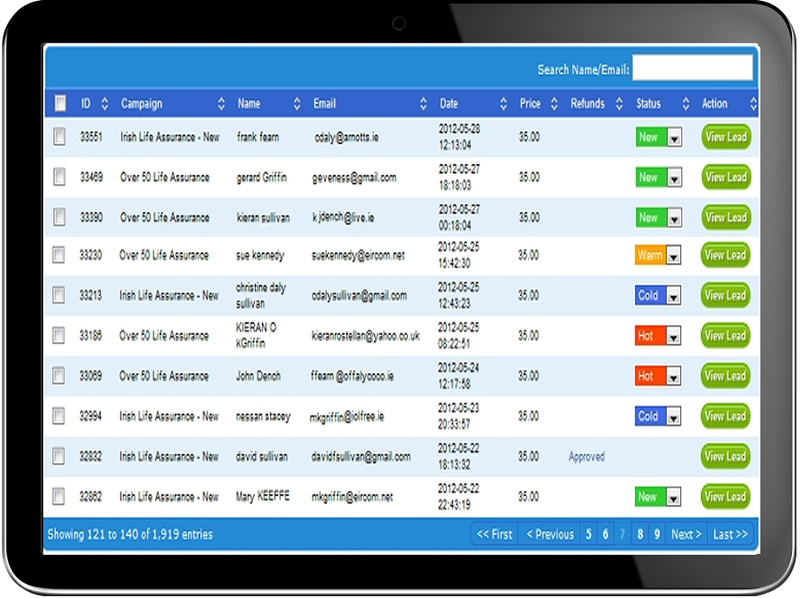 Instant Leads Generator gives you a whole host of lead management software tools. You can create notes and reminders for each and every lead, assign a priority, attach and upload documents. The system administrator can also assign exactly how much document storage space should be allocated to each lead buyer/recipient so you have everything in complete control. Sending an email to a lead is simple and you can do this whenever you view a lead. A record of each email is always saved so that you view it again in the lead’s Notes and Emails list. From detailed lead delivery reports, to lead ageing and pipeline reports your lead recipients will always know exactly how they are performing. Of course you have full control over which of these illuminating reports (if any) are available to your lead recipients. You have everything you need to to ensure that they only have access to the exact data you wish them to have and which data remains hidden from them. 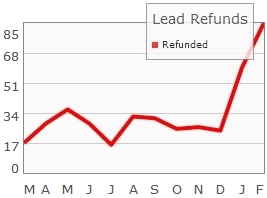 The refund reports literally enforces self-policing to ensure that buyers never return more leads than the maximum you have agreed with them. They always know their exact refund rate and won’t dare go above the limit you have set for them! Not only that, the ROI report will show them exactly how much money they are making from your leads. As the system administrator you will also have access to this powerful information which can help you to justify price increases and keep your buyers completely honest. The system administrator also has access to a range of powerful and illuminating reports. These reports gives in-depth understanding about each of your campaigns, affiliates, lead vendors, lead buyers and sales agents. You will always know exactly what profits you are making from each of them and which ones are causing you problems. Instantly spot those that are less than ideal and always be aware of which ones are sending back too many leads for refund. These reports will enable you to instantly spot problematic lead sources and help you to fine tune every aspect of your business for maximum profitability. Each report can be fully customized, so that you always know exactly what’s happening with every lead buyer, sales agent, campaign, vendor and affiliate. You will never be in the dark again and will be able to make decisions based on solid facts about their performance. 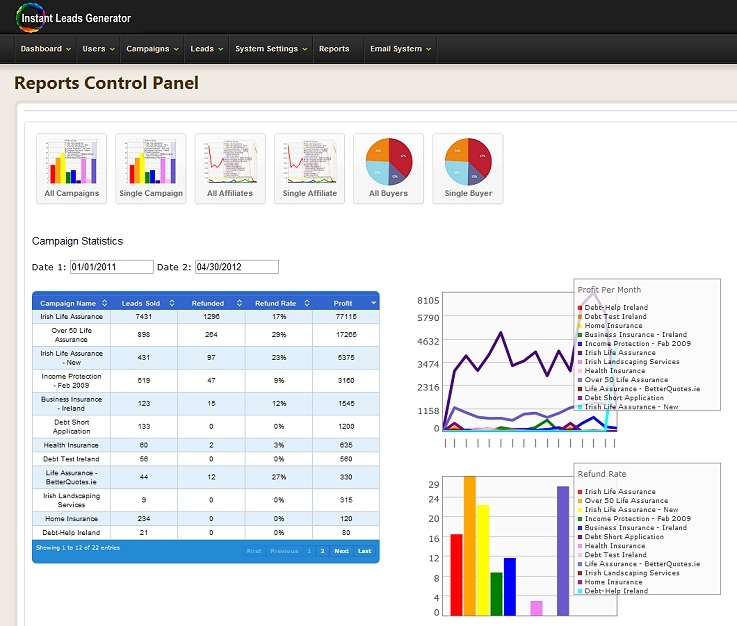 This is the ultimate easy to use lead management software you will ever need.